Today is the 60th anniversary of the beginning of the Korean War. On this day, North Korea crossed the fluid border around the 38th Parallel, Seoul changed hands four times, and the fighting settled after millions had died, right around the 38th Parallel. This is the present day border between North and South Korea. This was a world war without the title, a global struggle labeled as a police action. And once again, the major players weren’t always the people living through it. It is easy with history to get lost in statistics, in geography, in land grabs, markets, and extenuating factors. But it is important to remember that essentially history is a human tale. A migration of Person A from Point B to C, a social, economic, physical journey. And an aggregation of otherwise random factors into some future. This random aggregation brought my wife to me and that is why I consider it a good story. However random the events. 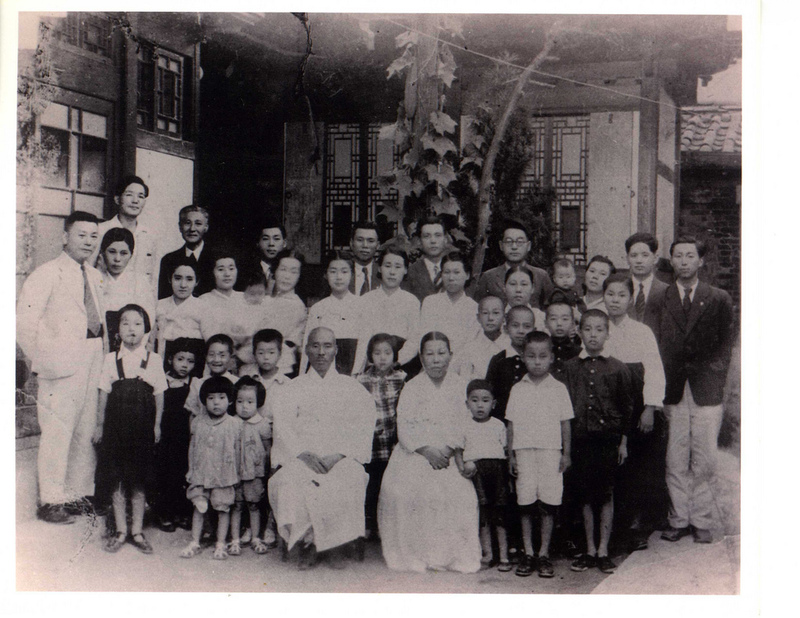 My wife’s mother is there off to the right as a baby (being held by her mother) in Daegu in 1948. The 20th century has been a period of cataclysmic change for Korea. It lost its independence to the Japanese in 1910, toiled for quite some time and achieved independence when Japan surrendered at the end of World War II (August 15, 1945). Russia occupied the area north of the 38th Parallel, the US south of the Parallel. Both constructed separate governments in their respective sections, elections were held in 1948 and the country was effectively and thoroughly split in half. It had never been so before. The Korean War cemented these differences and made them permanent (at least until another war). Families were split, brothers fought against brothers, tragedy loomed everywhere. My wife’s grandfather was a professor at the time, an intellectual, and when Seoul fell to the Communists he fled into the mountains surrounding Seoul to avoid capture. My wife’s oldest aunt, the daughter of the professor, would walk miles every day to deliver him food and news. She remembers the American planes strafing the ground thinking they were North Korean soldiers. The grandparents along with all the children would survive the Korean War, even though some members of the extended family were forcibly taken to North Korea and never heard from again. 이해남 and his wife 서경숙, my wife’s grandparents. My father in-law has a similar story. He was only about 8 or 9 at the time of the Korean War. When North Koreans took Seoul the first time, very few people fled thinking that North Koreans were like them and wouldn’t hurt anyone. They stayed and he remembers a North Korean woman speaking to his family about the benefits of communism and how they would be fed. Eventually the food situation became so dire that he remembers mixing dirt with his rice (the Korean equivalent of sawdust pancakes). He remembers fleeing Seoul altogether with his mother the second time that North Korea took the city. He remembers the American troops triumphant return and the years after the war. He said he learned how to say in English “Hey Yankee, give me gum.” He was always impressed with the American supplies, their health, their food, and their willingness to share it all. He decided to immigrate to America when he got the chance. My mother in-law’s family, being better off than most, resettled in Seoul. The grandfather was a professor of History at Hanyang University (한양대학교) in Seoul for many years, but eventually fell on the wrong side of Park Chung Hee‘s (박정희) political favor (almost everyone did at some point). They left for Canada, settling in Montreal and Toronto. My father and mother-in law grew up a few blocks from each other in Seoul. My father in-law knew my wife’s oldest aunt (all the families seemed to know each other), but never met his future wife until much later. My mother in-law’s entire family emigrated. My father in-law, alone from his family, emigrated. The family settled in Canada; the loner in New York. They met through a mutual friend in North America, married, and had my wife. My wife came to Korea in 1996 to teach and study; I came in 1998 to work and for adventure. We met in 2001 and fell in love. Even without the Korean War or the events of the turbulent Korean 20th century, I might have met my wife. We might have fallen in love and lived happily as we do now. But what I do know is that we did meet, we did fall in love, our paths did cross partly due to the events that put her family in motion from their ancestral homes to places far away. That is history to me.